He does look up my little pony online and I think he found it that way. But for the most part he just likes watching the show and looking at funny pictures of it. And that's been going on for a little while since spring maybe. The brony thing is a new comment and I think it does help him not feel as embarrassed that he was the only boy who liked the show. I don't think he is trying to spread the bronyness(?) And I don't know if he is hyped up by the culture of it, but he does know off the kid who was bullied at school and tried committing suicide. And it doesn't really bother me at all that he watches my little pony, there is worse stuff out there to watch. Main reason I started this conversation is because I've seen/heard online about the bullying regarding mlp and wasn't sure what to tell him when he came asking. I will definitely be asking him more questions tonight when we are at home. Honestly, its not that weird compared to some of the things he could be getting interested in. He probably got interested in it if he was already nerdy, but it seems more the comic-book-type crowd getting into it. I have known bronys (or bronies?) and they aren't THAT weird they just aren't. The show is actually really smart, funny, and targeted more towards adults then kids (at least I can tell from the gifs i've seen). Its not the MLP of the 80s and 90s people, its a culture to these people, its fun, its not much different then comic book culture at all, or D&D, or anything like that. They don't take themselves seriously, they know it is all in fun, and they know its feminine, and they most importantly know how to LAUGH at themselves. 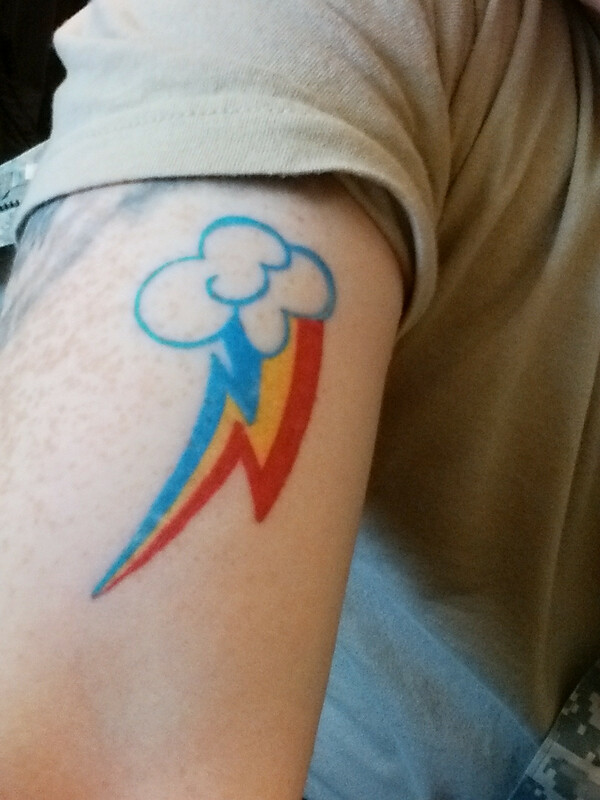 They get that its weird to be a dude who loves MLP, and they embrace their weird. Gotta be better to embrace the weird then deny deny deny! My Ex who was a Brony . He still loved sports and video games. It is really how girls have more choices on what can like or do but boys cannot. You know, about a year or 2 ago, my son said that he loved My Little Pony. My husband and I thought this was nuts. Then I started watching it with him. It's rather brilliant, especially the first season. And... on more than one occasion, there have been a gaggle of boys in my living room, watching it (black, white, Hispanic, and Asian). Then, we all watched the documentary on Bronys (husband included). And now, there's Equestria Girls. None of the boys in our neighborhood who watched the show are weird or outcasts. My son is definitely not an outcast and also enjoys "boy" stuff. I have no reason to think he's anything other than heterosexual, but he already knows that his sexual orientation doesn't matter to us. He's a well-rounded kid, and I enjoy spending time with him, even if it includes watching MLP and Jem (yes, Jem, from the 80s). If my son was embarassed about something, I would tell him that there's no reason to tell anyone, unless he wanted to. His real friends shouldn't care. I think this is a made up thread (trolling) for comments. Yet, I will answer, anyway lol. A 11yr old boy that likes My Little Ponies ( nothing odd, especially if he has younger siblings that enjoy watching the show). I would let him know his interest is his own and if someone ask why he likes the show then tell them. Nothing to be ashamed about. There are 11 yr old girls that like Pokemon and Chima. Def a double standard here. It's "Ok" for girls to do "male" things, even have mens' names but, NOT the other way. You are right! Cute tattoo. Look, to be very clear, I don't want to imply that all, or even remotely most of the people into fandoms like the Furries or MLP are frightening deviants. There is a lot of good in it. Imagination, art, friendship. But I stand by my position that a small percentage ARE, and I believe they use these activities and conventions as a cover to get in close to potential targets. As parents, it's our responsibility to always be vigilant and careful about who our kids associate with. A kid who is or isn't into any of this should not have a computer in a room with a door that can be closed, a private location, where they might be viewing disturbing imagery or chatting with anyone...there is a lot of unsavory stuff on the web, and an innocent intent can lead a kid into some pretty horrifying places. Rule #34, I believe it is...? It's not a red flag because it's MLP, because it's girly, or because it's not conformist. It's a red flag because it's a window into a big social group of mixed individuals with varying motivations. Most are harmless, but some are not. And frankly, when supporters of these subcultures get defensive about that, I think they (you? they? whatever) are being delusional. In all fairness, I feel the same way about many things like church, scouts, camps...parents need to check it out and make sure everything is on the up and up, and not just ASSUME that it's OK and none of the adults are up to no good. I would not, for instance, be OK with dropping my teenage son off at a Brony convention and leaving him there. I'd go with him if he really wanted to go, or make sure that an adult I know well and trust was there to make sure everything was alright. I just want to address these bits. Understand that with a lot of people (especially those who haven't had much exposure to the internet) the first bit is exactly their attitude - that MLP is a show with a much younger target demographic so anyone who's into it is either a child molester or just a disgusting pervert. People tend to be a little touchy about it, as I'm sure you would if you had an innocuous hobby that earned you judgement and mistrust from people you've hardly even met. To give an example: there was a thread I started a month or two ago on this very forum that was on a completely different topic where someone dug into my post history and found a MLP thread, and that started like four pages of nonsense about how I like MLP. I was being pissy in the original post of that thread so I'd rather not link it here, but if you want to see how people can act about it even online where things like this are more acceptable, I'll be happy to show you. I know, and I see some of that even here, if to a lesser degree than what I've seen in some places. It's also why I want to make my position very clear. I'm not a conformist myself, and I'm part of a very active social group of very close friends who are into what I'm into. If there's a word for what I am, it's "bohab" although that's an affectionate insult made up by the figures central to the thing. But anyways, I'm not judging the whole thing, I'd be the last to do so, just saying that parents gotta be careful.